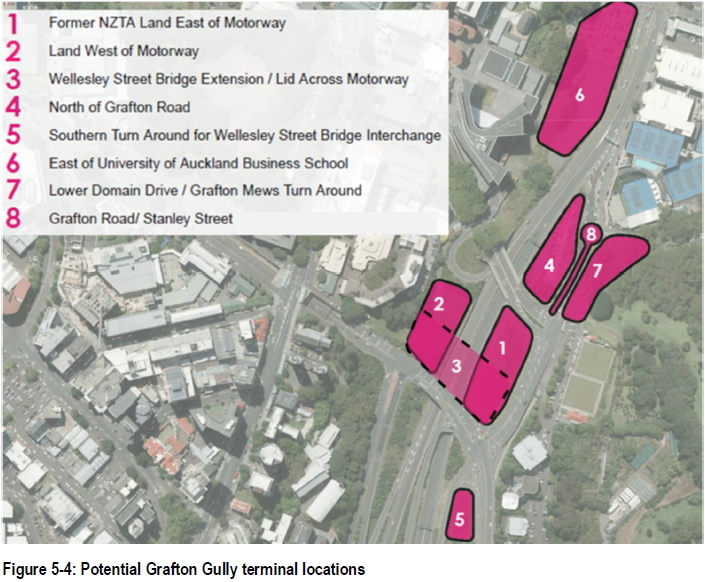 One interesting, and less controversial, aspect of the mid-town bus Indicative Business Case (IBC) was the discussion about terminal options in Grafton Gully. 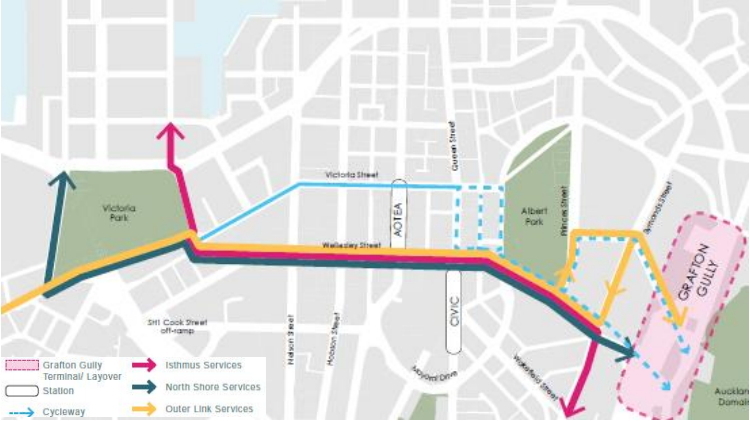 Under all of the plans that AT consulted the public on, a number of buses from the North Shore, such as the proposed NEX 2, would enter the city then travel down Wellesley St, upon which time something would need to be done with them. They could either terminate at that point or be directed somewhere else. Through routing gives a lot of advantages, such as opening up more travel opportunities, but that needs to be balanced as longer routes can be more susceptible to disruption and delay. And even if you do through route, there is still going to be a need to terminate some services, such as additional services that operate during the peak. But where in Grafton Gully? They then investigated potential options for where a facility could be built to handle the buses. Eight potential locations for a bus turn around facility and bus layover were identified. These are shown below. One of the more interesting was Site 3, capping part of the motorway. Capping the motorway between Wellesley St and Grafton Rd was one of the more aspirational projects mentioned in the City Centre Master Plan and so always felt a little less likely to happen. So there would be some sense of irony if had some or all of that happen on a project that was also making it harder to achieve the Victoria St Linear Park. 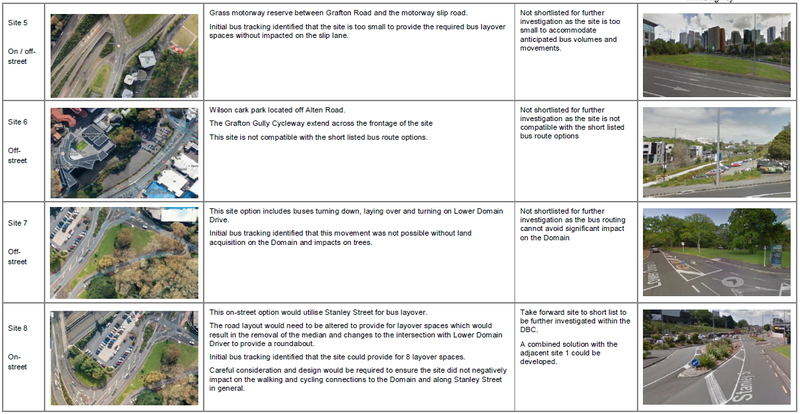 The sites were run through a multi-criteria analysis similar to what they did with the bus route options and that suggested the best two were sites 1 and 8, and the report also mentions they could be used together. 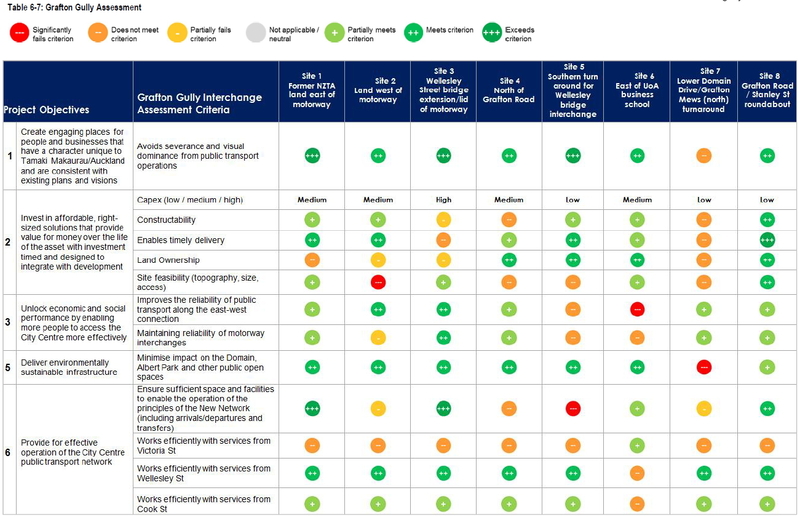 A description of each site and the findings are shown in the table below. Before buses use this potential facility to turn around they need to drop their passengers off somewhere. This is intended to be on Wellesley St, under and a part of the underpass under Symonds St. The IBC suggests a design for what that could look like. In both the images you can also see a shared path along that section of Wellesley St. That is part of the East-West cycleway that is to be developed in the area. That link would ultimately correct the bizarre situation of there being no walking access alongside Wellsley St. With the shared path running through the underpass, that would give a much easier grade for connecting to The Domain. While they’re not saying both projects would be tied together at this stage, getting both the underpass station and the path across the motorway would definitely improve the accessibly of this part of town. This seems like something that we can agree at have got right. I strongly suspect the criteria for the location of this involved AT finding the place in Auckland where traffic flows so AT can find some way to stuff it up. Though in typical AT fashion they’ve failed at finding the right spot! Grafton Gully as a bus terminal is ridiculous. You don’t stick terminals in the middle of cities. You stick terminals where the land value is cheaper on the outskirts. This can be achieved by not stopping buses in the city. All routes become ring routes. If it goes ahead this project will be another example of sub-optimal AT spending. Where’s the oversight? Where’s the thinking? Where’s the leadership? It’s a dead zone killed by a motorway trench. It is cheap land, given that they haven’t been able to sell it in the last ten years it’s clearly a dog of a site with little value. Is there a reason why layover in town is important? Operationally wouldn’t it be better to keep the busses rolling constantly and only stopping at the edge or depots? Since they need to run more buses into town in the morning, and more out of town in the evening, returning the empties to the depot adds significant cost, both in fuel and driving hours/driver wages. iirc drivers have a rest break while parked in the city, but driving back to the depot would add to their driving hours, requiring more drivers. There is also a lot of expense in that, extra buses, more staff, etc. Consider the evening peak when you want to add in all the extra capacity, say 20 more buses for the NEX. If you start those in Manukau istead, for example, you’d have to start them all about an hour earlier and have twice asn many buses on the road to have them picking people up at the Uni at the right time. Likewise in the morning. After dropping people off in town and uni, do you stop there, or do you drive them all the way across town before turning the around and driving them back again. LOVE Terminals.. Lets have more and bigger! You guys run this TRM as a parody account, right? For a while I thought there really was someone this misinformed but with the last few posts you’ve gone completely over the top with some unbelievable rants. I mean, no one could be this ignorant, so I’ve seen right through your little joke. Good one! This post is clearly a personal attack and violates the terms and conditions of this site. Moderators please remove Harrymc’s post. any reduction in land values would get chewed up pretty quickly by the dead mileage that creates – bus stations/ terminal are actually very important in centres – the trick is integrating them/ hiding them which isn’t much of an issue in Grafton Gully. For the love of God, that cannot be allowed to be a shared path, please! A route like this would be thick with pedestrians. And I won’t pretend that pedestrians wouldn’t spill into a dedicated cycle lane – of course they will – but at least it would give bikes the ground to assertively ding their bell. You would prefer it to be a footpath only? Sure it makes for a tiny footpath and tiny cyclepath. Which is why I concede it would become a de-facto shared path. But having a delineated cycle space alá Tamaki Drive will give bikes the ‘right’ to ding peds to the left. For the love of God don’t use Tamaki Drive as a successful example of a segregated cycle and pedestrian pathway. Tamaki Drive is woeful, but with separate surface treatments, a similar approach would be OK for the short stretch of restricted width in the underpass. A big improvement on a free-for-all approach. The remainder of the path, where hopefully there is more width available should definitely have a proper separation. If there are large volumes of pedestrians then they should get more than half the path, which makes for a narrow cycle lane. Otherwise the pedestrians are crowded into a small area and will inevitably spill into the cycle lane. If there are not many pedestrians then it’s not really an issue at all. Or everyone can just share for short bit through an underpass where there is a pinch point. Cyclists slow down, pedestrians keep left etc. Not ideal but the only viable alternative is to ban one or the other. Given its a bus station, banning cyclists would be the likely outcome. +1 to Nick R, this is a huge pinchpoint for CBD access and I actually think cyclists should be the lowest priority here. Sure, the underpass section is a tight spot and compromise will need to be made. But note that on the diagrams the entire yellow routes are labelled ‘Shared Path’, even where it’s brand new infrastructure with no width limitations. Make that road along side the university into a shared space and send every up, over Symonds St and down the other side? Then that lane could be bike only. Really, force all the bus passengers up and over the hill so that cyclists don’t have to share? Sounds a but crazy. But most people on foot would do that anyway. If you look at the plan there appears to be stairs and a lift up to Symonds St, so won’t be huge crowds of pedestrains at the lower level. It’s a practical solution if you really want cycle traffic down that lane. Unfortunately I really feel that this will have to be shared path or no cycle access…. Looks like a reasonable compromise to me. 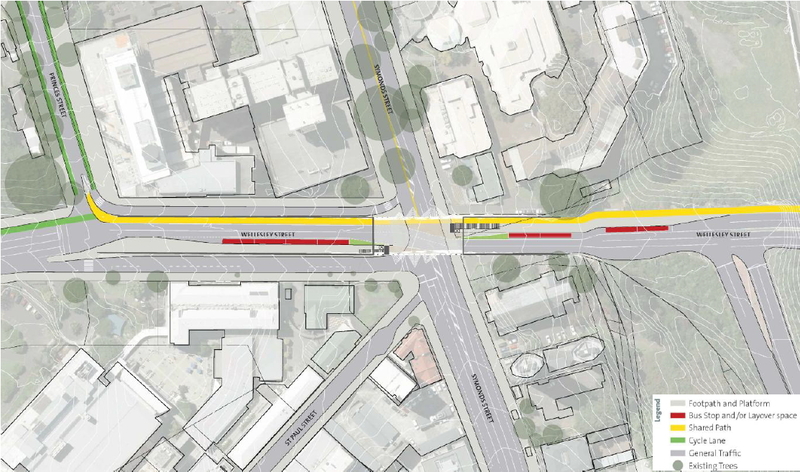 As a bike user and a pedestrian I would be delighted to have the opportunity to avoid going all the way up to the Symonds St ridge to access the Unis or the city from the Grafton Gully path, even it means slowing right down when riding to mix it with pedestrians… Can’t wait for that option actually. Biggest puzzle is why the proposed, and desperately needed, east-west shared path under Symonds St shows no link to the already extant Grafton Gully route…? Figure 11.7, last image on right? The solution to that puzzle is gradient. You can’t actually get a ramp down from the western side, although you could do stairs. Well except one thing they aren’t short on there is land. Sure you could do stairs with a push ramp. You could also do a switchback path, or a spiral, or some other shape of meander to overcome grade with length. It’s only about 4m height difference, surely not an impossible task to design. I don’t understand why option to connect to Grafton Gully Cycleway not possible in underpass option if combined with Clip on bridge option on the right picture. Isn’t the land the same height pretty much right next to the road – the starting point to branch off from the road to cycle/ped only bit? 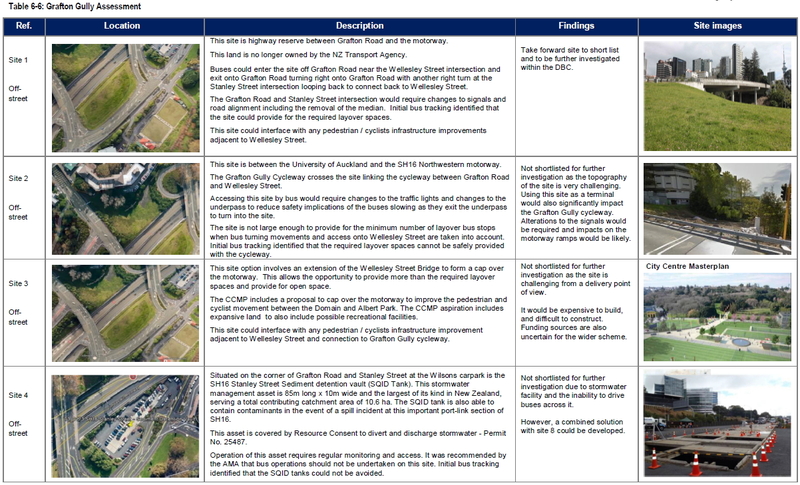 Just wondering – where in all those project objectives, is pedestrian and cyclist safety? The earlier it is considered, the more can be done. If it isn’t listed as an objective at this stage – does that make it more difficult to design for safety at the next stage? I would have thought it was at least as concrete an objective as most of the others listed. Safety audits are supposed to be done at concept, scheme, detailed design and post-construction stages. That does seem like an enormous omission. Apple maps on my ipad often tells me to walk or cycle through that underpass. It will be nice when that is legal and safer. From what I can see above this is the terminal for North Shore services, so they all go to and from the harbour bridge. I mean for the Isthmus sort of services, should be around 36 buses per hour in morning peak coming in on the new network that they wanted to loop around Bowen Ave? Terminal options 1 & 8 together, 8 could also use just part of 4 as it suggests. I don’t get option 8? Wasn’t some of the criteria about the space being big enough. Basically whats the point of 8 its just a round about. Could use any roundabouts any-ware? Also NZTA could fund a over bridge for bikes 3 metres wide right into Domain. Read the details in the table above. It’s a roundabout in combination with bus layover spaces on Stanley st. The roundabout lets the buses turn to get in and out of the layover. That actually sounds like an efficient and pragmatic solution. I know Nick R. I read that and I mean even with the layover road. Still what is said is true? Weird? I don’t follow you sorry, what is weird? The termina is just a place to turn and layover buses, the arse end of the grafton gully motorway is as good a place as any. They will go for option 1, and make number 3 to join onto it in the future, Southern and Western Buses could pass through here also if needed with good walking/ cycling to the Train stations. I’m not sold on the bus stops in the underpass idea, mainly because it will be too hard to get good bus priority through here with only one motor vehicle lane each way in the underpass, lots of turning traffic with the motorway ramps, and no likelihood of private car traffic reducing on this section since it is a main motorway access point to the city. Shouldn’t we be focusing bus stop and terminus developments on routes that can be made congestion free in time, either by being wide enough for continuous bus lanes (like Symonds St) or practical to close to private car traffic (like the other parts of Wellesley St)? Better put the bus stops somewhere else, maybe the North Shore buses could loop around Alfred and Princes Sts like the Outer Link, or go up the ramp to Symonds St and continue through to Newmarket with layover space able to be built on the unattractive land under the Newmarket Viaduct. Without the bus stops I can see the shared path being a brilliant asset (my view is shared paths can be ok where there are few driveways/entrances, and not too many pedestrians for the width allowed), but will be a fail if passing through a busy bus terminus. Does it matter if the last 50m of a route has no priority though? Doesn’t look like wrist-slitter to me. The traffic on that link is incredibly peaky, as will be the bus usage. Luckily those peaks operate in the opposite directions, in the morning bus passengers are heading out to the university, while traffic is heading in to town, vice versa in the afternoon. If counterpeak buses get caught in traffic, then at least there will be few of them and they’ll have few passengers affected. I believe NEX2 as a passenger service terminates at the underpass, then the bus actually terminates at Terminus so Bus Priority for Eastbound Buses around this point isn’t really very important. +1, as long as we can get it to the lights at Princes Street without any traffic that last 50m to the platform isn’t going to matter. In the plan there are two lanes leading up to portal, and one through it. So if one of those lanes is a bus lane which gets a B-advance phase, then no problems. Fair comments, but I’m still sceptical. I can imagine traffic trying to get to the motorway backed up nastily if there is an incident on any of the motorways, or on most rainy days (a bus advance phase on the traffic light is little use if traffic from the previous phase hasn’t yet moved). I don’t drive here often, but I imagine useful (albeit anecdotal) information might come from asking a car driver who regularly uses this route at peak time how many days a month it gets badly gridlocked. Even if it’s worst for the counter-peak buses, delays to those services mean they aren’t in place to start the peak services on time. Routing these buses on the Outer Link route around Princes, Alfred, and Symonds Sts would probably (a) allow the buses to better avoid congestion, (b) could still link to a Grafton Gully layover facility via Grafton Rd (c) looks cheaper than all the more substantial work to fit the bus platforms in the underpass, (d) allows a better quality cycling/water facility to be built through underpass and beyond it. This looks like an excellent location for a bus terminal but even more so for CFN metro rail line NW which could run down the gulley and also have a connection to the existing HR network below Parnell. Metro station University and future tunnel through to Aotea and off to NS metro line.